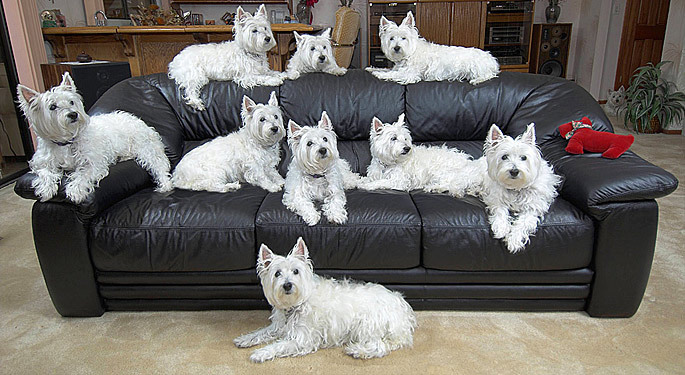 When you own a terrier (or two), it often seems like ten canine cyclones are competing for your attention. This is our Westie (West Highland Terrier) Katy, lounging about in a rare moment of calm. Well, of course, it's actually TEN Katys (look carefully) in a Photoshop composite I created a few years ago. The process is actually quite simple, but requires careful preparation for best results. The camera was secured on a tripod and set to manual focus and exposure, then multiple photos were taken (lit by 2 remote strobes) with Katy placed in a different position for each shot. The images were then layered in Photoshop and in all but the bottom layer each Katy was clipped out and the background removed. Judicious selection, exact registration, and proper feathering around each layer makes it virtually impossible to detect which is the "actual" original shot with only one terrier present, even in the final 13" x 19" print. After 20 years of foot and paw traffic, our dining room floor was looking shabby. 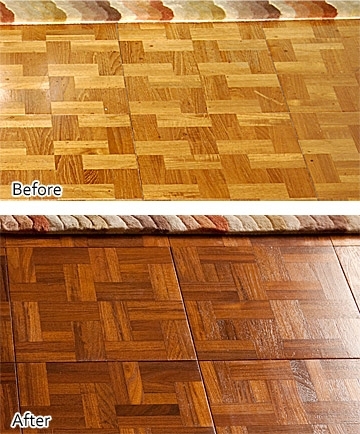 The original teak parquet had accumulated countless scratches and water stains, and faded to a dull lifeless color. Replacing the floor would be too expensive (and teak hardwood parquet is no longer available), so I considered refinishing the wood. Unfortunately, consulting the manufacturer's original product literature was discouraging - "Never sand or refinish the parquet tiles", it admonished. A few days of sanding, re-staining, and 2 coats of polyurethane did the trick. Sometimes it pays to forge ahead and ignore those words of advice from the experts. Hopefully, we'll get another 20 years of use! My wife and I first met Jim Warren and saw his paintings at the Westwood Art Show in 1985. We instantly fell in love with his art, beautifully detailed yet surreal scenes that draw the viewer in for a closer look. In that same year, Jim began creating book and album covers, popular movie posters, and magazine covers, garnering an ever-growing number of admirers. In 1990 his work "Earth...Love it or Lose it" received critical acclaim and became a symbol for the emerging global environmental movement. In 1992 he collaborated with famed marine life artist Wyland, producing a series of works showcasing their combined talents. Jim Warren published two books, The art of Jim Warren: An American Original and Painted Worlds, and in 2004 began a series of Disney/Warren fine art prints featuring popular Disney characters. He continues to paint imaginative and fanciful scenes, many of which are available as limited edition prints. 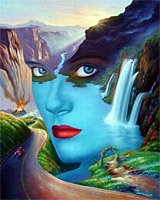 Visit his website jimwarren.com and spend some time viewing his colorful gallery of paintings. Not wanting to ignite a holy war (as often happens with PC vs. Mac discussions), but why is Apple still playing the same old tune with their TV ads? You know, that "I'm a Mac" routine with the "PCs are crash-prone and virus-ridden" punchline. I may be dating myself, but is it still 1984? 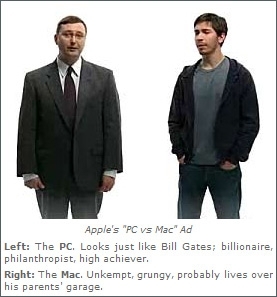 As before, the PC is a clueless business suit, while the Mac is cool, young, and trendy. Well, I guess only if you consider an unshaven, unemployed slacker type as "cool". Don't get me wrong. I was once one of the Apple faithful myself, having cut my teeth writing assembly code for the original Apple II (remember the "Wozpak"? ). I even had an Apple Lisa, which I still consider more revolutionary than the first toy-like Macintosh that came soon after (I waited for the Mac II). So I admit to having a soft spot for Apple, even though I migrated away years ago when my needs changed. It pains me to see Apple taking the low road. What was clever 25 years ago is now just juvenile. And the greatest irony is that the Mac continues to evolve along a path that makes it more PC-like every year. Fact is, the Mac is a polished and competent personal computer that has a decent market share, but its cachet is largely illusion. An illusion that Apple is determined to perpetuate. There are many interesting relationships that arise from the properties of primes (an integer divisible only by 1 and itself). Just for fun, I'll be posting occasional factoids involving primes or basic number theory. Even if you're not a math geek, I promise your head won't explode. A sphenic number is an integer that results from multiplying 3 distinct primes. For example, the first sphenic number is 30, which you get by multiplying the primes 2, 3, and 5. The first 10 sphenic numbers are 30, 42, 66, 70, 78, 102, 105, 110, 114, and 130. Note that 105 is the very first odd sphenic number and shares a few other notable properties. Exercise: With any product of 4 unique primes, how many possible divisors will there be? Today I was revising some web pages on my primary website mvoDesign and decided to design a background similar to that which adorns these pages. I chose another photo from my portfolio of waterdrop macro images, which captures a small droplet just as it plunges into a clear glass of water. Three studio strobes froze the motion, and colored gels tinted the waterdrop with a saturated red color. In the slightly revised version above, I changed the overall hue in Photoshop to get an ice blue color, which actually looks more natural than the un-retouched red version, which you can see here. I love the "fractured" look within the droplet, which probably results from internal light reflections of the drop/water interface at the plane of impact. To see more of these photos, feel free to visit my water art gallery. The two studio sessions I did back in early 2007 were a great learning experience which tested my patience (something I sorely lack), but yielded some wonderful images that I continue to enjoy today. For the technically curious, a photo and detailed description of the camera setup appears on PixArtWeb in a blog entry I made in September 2008.